The president of FC Barcelona, Josep Maria Bartomeu, was invited by one of the most prestigious academic institutions in the world, Harvard University, to give a lecture on Barça’s social commitments as part of the sessions on Participation, Inclusion and Social Responsibility in Global Sports organized with Simmons College on June 1 and 2. The director general of the Barça Foundation, Mària Vallès, and the director of the club’s Strategy and Knowledge Area, Javier Sobrino, also attended. The president was speaking at Loeb House, the old residence of Harvard governing boards, before an audience made up of people from the worlds of sport, professors, leading academics, businesspeople and reporters, including Mike Calise, the assistant coach of the Harvard women’s team; Israel Ruiz, executive vice-president and treasurer of MIT; Rebekah Salwasser, executive director of the Boston Red Sox Foundation, Lillian Thuram, the former Barça player and president of the foundation that carries his name, and Nicholas Randall, the chairman of Nottingham Forest, among others. 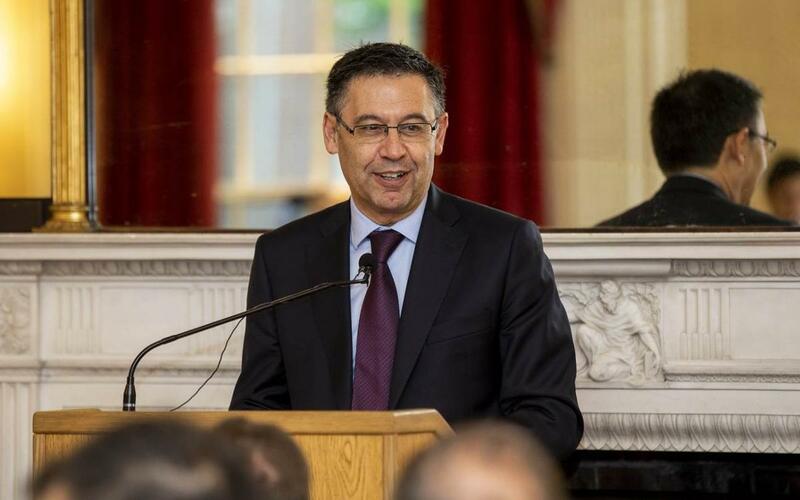 Bartomeu spoke about how Barça helps to make society better through the positive impact of sport, in the form of programs such as Barça Innovation Hub, La Masia and the Foundation, and also some of the reasons why Barça is more than a club. “We are committed to charity causes and help the most at-risk children, because we are convinced that children are our future, the future not just of Barça, but also of our society and our world. Our capacity to help children through sport is unquestionable. And that is why the Barça Foundation fosters equality and values through sport”, he said, while also explaining the core action areas where the Barça Foundation is currently operating: Prevention of violence, social inclusion and education in values. Bartomeu also explained the club’s reasons for setting up the Barça Innovation Hub, the platform that brings together all of its research, innovation and training programs “to stimulate knowledge and innovation, and thereby help the club and society in general. And we can do that because we are the biggest laboratory in the football industry." "Because there is no other club that has 2,108 athletes, 5 different indoor and outdoor professional sports, 9 amateur sports, 121 teams and more than 300 million fans all around the world. We have to exploit all of that to become a source of knowledge generation, both internally and externally, to make us even more attractive to our partners in order to develop research and innovation programs”. During his speech, Bartomeu also spoke about the reasons why Barça is considered to be more than a club, such as its ownership structure whereby it is the property of its 144,000 members, the fact that it has five different professional sports sections plus another nine amateur ones, having a globally acknowledged style of play and the human and sporting education offered by La Masia to 617 Barça youngsters, and its focus on women’s sport. The president also spoke about how proud the club is off its roots and its sentimental links with the city of Barcelona and Catalonia. All these elements of the idiosyncrasy of Barça help to make it unique, not to mention the culture of excellence that fosters constant improvements on a sporting and corporate level in the demanding environment of 21st century soccer. “We aspire to enrich our singularity because of our nonconformist culture, which always drives us towards new levels of sporting and corporate excellence. We aspire to be different through excellence” said Bartomeu, adding that: “We have a vision: we want to make the most of all our strength as a club and as a brand to change the world through sporting excellence. But this is not the typical clichéd claim of big corporate manuals. We like to think that this is the same view that’s shared by everyone that forms part of this club, not just the athletes but everyone that works at it”. Finally, Bartomeu invited his audience to “share this culture of excellence with everyone else who is equally convinced that a better future is always possible. The more agents are involved in this culture, the better the results will be. That is one of the responsibilities that we cannot ignore”. Before the conference, which went down extremely well with everyone in attendance, Bartomeu took a walk around the Harvard campus in the company of Mària Vallès, and presented a shirt to Stephen Ortega, the university’s head of international relations and the organizer of the workshops, beneath the statue of John Harvard, founder of the university and an iconic location on its grounds. The Barça president will also be using his trip to Boston to pay a visit this afternoon to the Massachusetts Institute of Technology. Bartomeu will get a first-hand glimpse at the research program being undertaken by FC Barcelona, via the Barça Innovation Hub, in conjunction with a team from the MIT Sports Lab. The aim of the program is to analyze and catalog, through different data analysis techniques, the different ways that Spanish Liga teams attack. The project involves eight students of different subjects (Computer Science, Mechanical Engineering and Business Administration), and is being led by two professors from the Department of Mechanical Engineering at the MIT, Annette Hosoi and Christina Chase. This multidisciplinary group is coordinating efforts with one of the knowledge areas of Barça Innovation Hub, focused on Sporting Analysis and Technology. The main purpose of this area of BIHUB is to complement the expert views of the coach through the development of data analysis to assess different playing situations depending on the position of the players with respect to the ball.